Dr. Mary Newport, desperate after orthodox medical attempts failed her husband’s dwindling dysfunction from Alzheimer’s, discovered coconut oil and rescued him from having to be put away in a special home. Both the Internet’s coverage and her book started an international grassroots movement of folks with very early dementia, even just brain fog and senior moments, trying themselves or helping relatives diagnosed with Alzheimer’s. Thus creating a wave of success reports and testimonial videos. However successful those reports were, mainstream medicine wasn’t recognizing coconut oil as an effective aid for Alzheimer’s or any type of dementia. Even the Alzheimer’s Association and other similar groups still won’t recommend or mention coconut oil to Alzheimer’s sufferers simply because there are no peer reviewed studies. But somehow, a recent peer reviewed study has been completed and published with another in progress with positive results. This clinical trial was conducted in Spain, which explains why the study was done to begin with. Spain and other EU nations and middle eastern nations, including Israel, seem less restricted with what they can study without pharmaceutical funding. Spain and Israel have done considerable research and human studies on cannabis’ medical applications, for example. The Spanish clinical trial involved following Alzheimer’s patients of varying ages and genders with and without diabetes diagnoses to determine if coconut oil consumption had any effect on reducing their Alzheimer’s mental dysfunction. They used cognitive testing before and after the clinical trial to determine changes. The intervention group was fed 40 ml of coconut oil daily, which comes to 2.7 tablespoons. Another clinical study, supported by private funding of course, on the effects of coconut oil for Alzheimer’s has been underway in Florida. It was started in 2013 at the University of South Florida’s Health Byrd Alzheimer’s Institute, located in Tampa, Florida. Publishing for that study is expected in 2016. But word on the street is that there has been a high success rate. 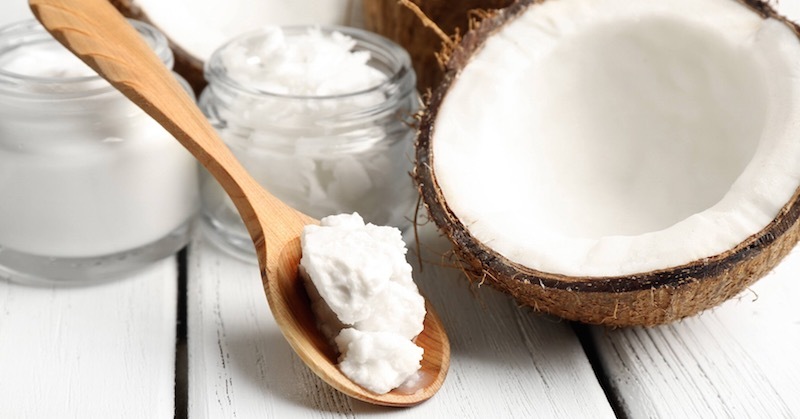 First, let’s clear the air on the outdated coconut oil saturated fat issue. Clean saturated fats that are not hydrogenated or otherwise adulterated, are necessary for overall and brain health. They are not the source of obesity and heart disease. The notoriously faulty Ancel Keys Seven Countries Study, which was accepted whole cloth by the medical establishment, media, and the processed cooking oil and margarine manufacturers in the 1950s. It gave Crisco and others the platform to pitch their unhealthy processed hydrogenated oils containing trans-fats to replace coconut oil, palm oil, and butter. It’s been determined that hydrogenated and semi-hydrogenated oils containing trans-fats are more responsible for obesity, heart disease, and various autoimmune diseases including rheumatoid arthritis. Refined carbohydrates, added high sugar, especially high fructose corn syrup (HFCS), have added to the rise in obesity with heart problems remaining at the to of disease morbidity despite the no or low fat mania of several decades. So far, not one pharmaceutical drug designed for Alzheimer’s has been successful with anything but creating adverse side effects. That’s why Alzheimer’s is considered “untreatable”. Big Pharma has nothing to offer so nothing exists from the AMA perspective. One study discovered that many with high cholesterol counts live to well into their 80s. Ironically, blockbuster Big Pharma revenue statin drugs cause more by doing what they claim, reducing cholesterol counts. From Dr. Stephanie Steneff: The brain represents only 2% of the body’s total mass, but contains 25% of the total cholesterol. Cholesterol is required everywhere in the brain as an antioxidant, an electrical insulator (in order to prevent ion leakage), as a structural scaffold for the neural network, and a functional component of all membranes. Cholesterol is also utilized in the wrapping and synaptic delivery of the neurotransmitters. It also plays an important role in the formation and functioning of synapses in the brain. This similarity to diabetes 2 with it’s cellular inability to process insulin, or insulin resistance, that is a major reason why Alzheimer’s or any similar dementia is considered diabetes 3. The solution for diabetes 3 is ketones derived from the liver’s processing coconut oil MCTs. The ketones furnish brain cells with what they need regardless of insulin resistance that hampers glucose cellular metabolism. Ketones also increase blood circulation in the brain, a nice byproduct. But ketones are easy come easy go. One needs to maintain a steady diet of healthy virgin coconut oil at the recommended pace of three or more tablespoons daily to maintain the cells energy levels. The building blocks of brain matter are made from cholesterol. Coconut oil supplies that as well as the ketones that provide the brain energy despite insulin-glucose issues. With coconut oil, one gets the benefits of better brain structure and increased energy capacity. Great information! I have had my wife on coconut oil for four years. She is still home with me. I got her started about two years late. It has slowed down the Alz. and she is showing some signs of a very slow come back. Again thanks for the article and pray for my wife Barbara Jean Robinson living in Russellville Ar. Hi John, thank you for sharing about your wife’s condition. Keep on keeping on – natural healing works! We will be praying for Barbara. God bless!